A female Chinese student shows a 3D-printed model of the mooncake to celebrate the upcoming Mid-Autumn Festival on the campus of Yangzhou University in Yangzhou city, east China's Jiangsu province, 12 September 2016. 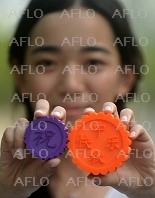 A female Chinese student shows 3D-printed models of the mooncake to celebrate the upcoming Mid-Autumn Festival on the campus of Yangzhou University in Yangzhou city, east China's Jiangsu province, 12 September 2016. 3D-printed models of the mooncake made to celebrate the upcoming Mid-Autumn Festival are pictured at Yangzhou University in Yangzhou city, east China's Jiangsu province, 12 September 2016. A Chinese student draws a mooncake to be made by 3D printing to celebrate the upcoming Mid-Autumn Festival at Yangzhou University in Yangzhou city, east China's Jiangsu province, 12 September 2016. A mooncake is being drawn before being made by 3D printing to celebrate the upcoming Mid-Autumn Festival at Yangzhou University in Yangzhou city, east China's Jiangsu province, 12 September 2016. A 3D printer makes a model of the mooncake to celebrate the upcoming Mid-Autumn Festival at Yangzhou University in Yangzhou city, east China's Jiangsu province, 12 September 2016.